April 2, 1976 was a busy day of trading among NFL teams. In one of the deals that occurred, the 49ers sent nine-year veteran QB Steve Spurrier to the expansion Tampa Bay Buccaneers for WR Willie McGee, LB Bruce Elia, and a second-round draft choice (used to take Eddie Lewis, a defensive back from Kansas). McGee and Elia had been obtained through the expansion draft, from the Rams and Dolphins, respectively. McGee lasted two seasons in San Francisco and Elia for three, starting nine games at middle linebacker. Lewis was with the Niners until moving on to the Lions during the 1979 season, starting every game at cornerback in ’78 and intercepting three passes. 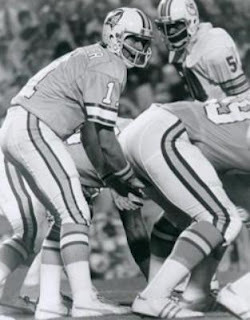 More significantly, the way was thus cleared for Jim Plunkett, obtained from the Patriots shortly thereafter, to become San Francisco’s starting quarterback. Spurrier, who turned 31 later in the month, had won the 1966 Heisman Trophy at Florida and was San Francisco’s first draft choice in 1967. He became the punter and backup to veteran quarterback John Brodie. In his first five seasons, Spurrier threw a total of just 204 passes, most of those when he started four games after Brodie was injured in 1969, and completed 108 for 1232 yards with six touchdowns and 18 interceptions. Not very mobile and with a slow release, Spurrier had the arm strength to throw deep but was a mediocre short passer. Nevertheless, he had drawn generally good reviews for his performance in place of Brodie in ’69 (the 49ers led the NFL in passing yards with 3158 in an otherwise disappointing season) and was still considered to be a good prospect. While it was back to the bench in 1970 and ’71, Spurrier again stepped in when Brodie went down with an ankle injury five games into the 1972 season. He filled in admirably in what proved to be his finest NFL season, completing 54.6 percent of his passes for 1983 yards with 18 TDs against 16 interceptions. The club went 6-2-1 during his starts, on the way to the playoffs for the third straight year. However, Brodie came off the bench in the season finale to rally the 49ers into the postseason and started against the Cowboys in the NFC Divisional playoff game. In 1973, Spurrier finally displaced the 38-year-old Brodie as the team slumped to 5-9. Injured a week prior to the 1974 season, he saw action in only three games and in ’75 split the starting job with another aging veteran, Norm Snead. His nine seasons in San Francisco had ultimately been a disappointment. He passed for 5250 yards with 33 touchdowns and 48 interceptions and had a 13-12-1 record as the starting quarterback. In truth, Spurrier was expected to be nothing more than a caretaker for the new club, although there were hopes that offensive coordinator John Rauch would bring out his best. But the Buccaneers were a typically poor first-year squad, especially when it came to running backs and receivers, and went 0-14. Spurrier started 12 games and completed 156 of 311 passes (50.2 %) for 1628 yards and 7 TDs with 12 picked off. Moreover, he was also sacked 32 times. His finest performance came against the Chiefs when he went 20-of-36 for 212 yards with two touchdowns and no interceptions – it was his only 200-yard passing game of the year, and one of only two in which he tossed more than one scoring pass. It proved to be the end for Spurrier’s career as a pro quarterback. He retired as a player but went on to a long and successful college coaching career, beginning with his becoming quarterbacks coach at his alma mater of Florida in 1978. Prior to head coaching stops at Duke (20-13-1 record), Florida (122-27-1), and South Carolina (66-37 through 2012), Spurrier coached the Tampa Bay Bandits of the USFL for three years (35-21) and, after winning six SEC titles and a national championship at Florida, had a far less successful two-year tenure in the NFL with the Washington Redskins (12-20).